Under a canopy of trees love was abundant and promises were made. Not long ago, my husband and I reconnected with our relatives in the beautifully lush Hunter Valley for the wedding of my sister in-law Ellie and her husband-to-be Brock. You may remember the sophisticated and elegant wedding invitations I posted earlier, and if you do remember you will find that this event was destined to be sleek and elegant from the very start. 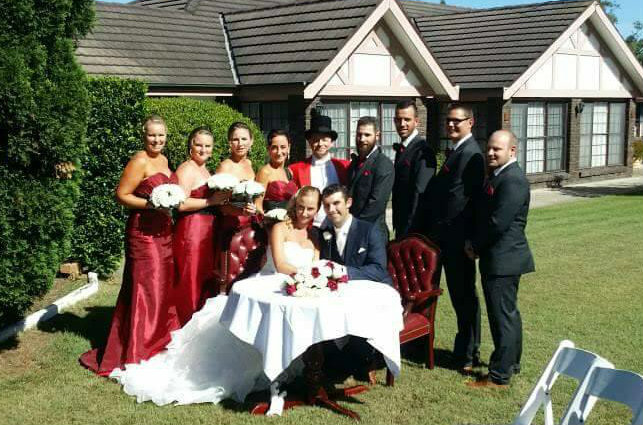 With the classic style wedding themed in burgundy, red and black, the ceremony took place on the beautifully manicured lawns of the Sir Francis Drake Inn Hotel, where a vast majority of the guests were staying over the celebratory weekend. When the sun came out (and with not a predicted cloud in sight) the bride came down the curving pathway of the main garden flanked with ornate grass, strewn red rose petals and rows of crisp white gladiator chairs. 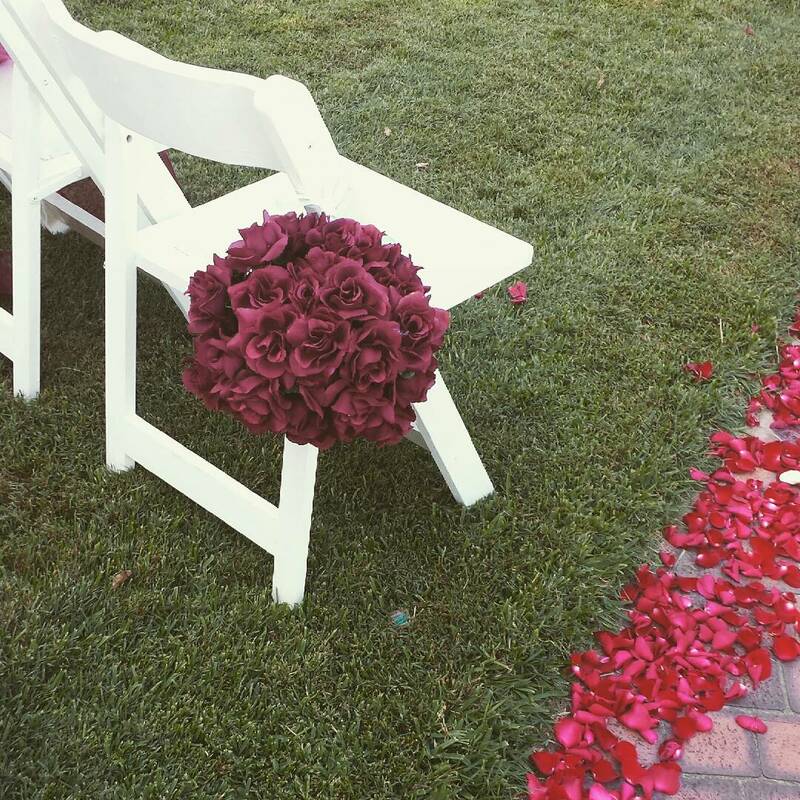 Hung at the end of each row of gladiator chairs was a beautiful burgundy rose pomander ball to help pull the wedding colours into the ceremony seating arrangements and break up the brilliant green of the lawn. 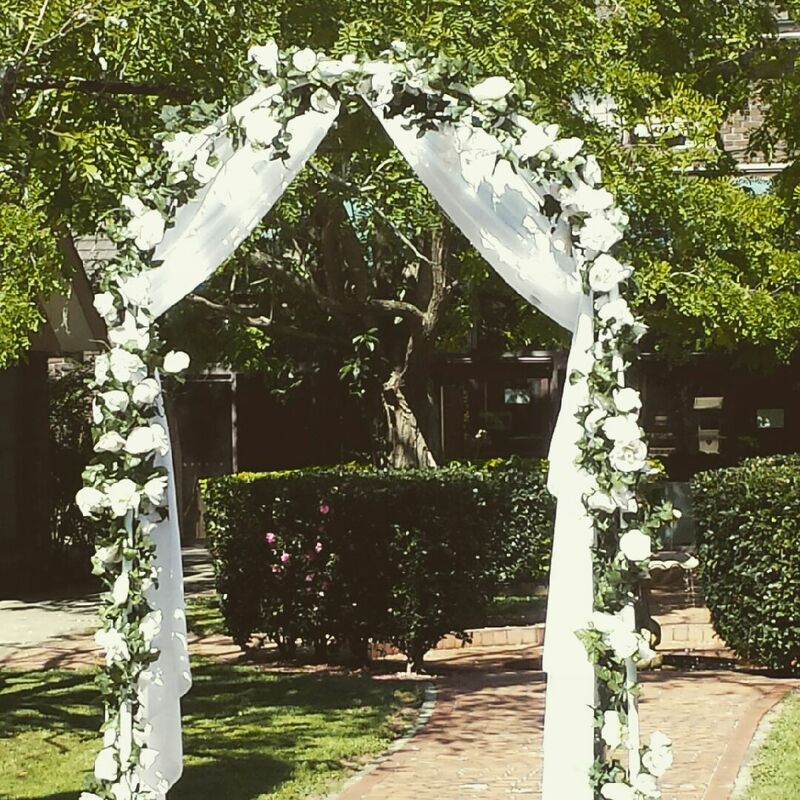 Reaching the groom at the front of the alter was a white wire-framed arch that was covered in white roses and billowing white fabric, set in front of a beautiful clay fountain to create a picturesque setting for the bride and groom to take their vows. Flanked on both sides were perfectly formed hedges and giant Roman style floral vases to continue with the stylish garden soiree feel, but released hidden bubbles into the sky as the bride and groom were pronounced husband and wife. Off to the stage left of the archway the signing table was situated as a white linen covered round table adorned with two antique style red leather classic ornate office chairs. It gave the wedding a continued feeling of whimsy and contrast, as well as a sophisticated way to tie in the overall colour theme of the wedding into the signing table as well. After the ceremony, the bridal party continued on their way to take photos while the guests played a series of lawn games such as croquet (which I happen to have discovered I am amazing at!) and lawn bowls. Moving into the reception area, guests were greeted with an elaborate cathedral style venue within the manor that boasted several large trees that spanned out to create a lush canopy above the tables. Dripping with twinkling fairy lights that dipped in and out of the trees, the atmosphere was a unique and charming take that took the garden style sophistication of the ceremony to next the level. 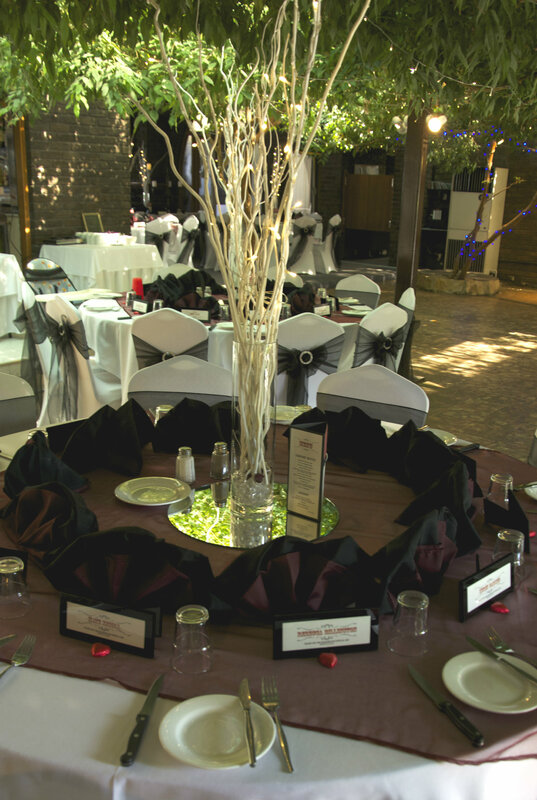 The reception tables were adorned with red and black gauze table runners, as well as black and burgundy napkins that brought the overall colour feel to the round tables. Each guest received an adorable black photo frame in which to slip a photo booth strip that was also included and set up at the venue and take home as a memento, and the stationary of the previous mentioned invitations were included throughout the venue with the same style, font and beauty used as place card holders within the frames, as well as table directions. 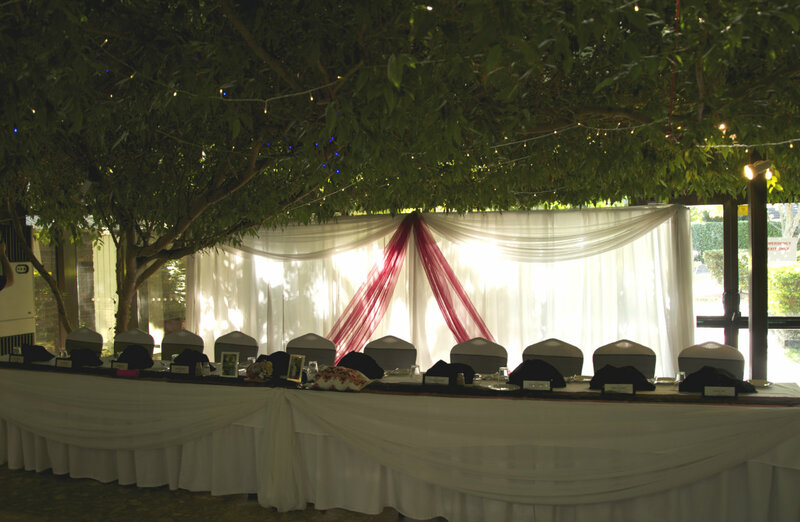 Black chair sashes were tied around the linen draped tables and adorned with the customary diamante finish that was first utilised in the invitations. And where would we be if we didn’t talk about the wedding cake? 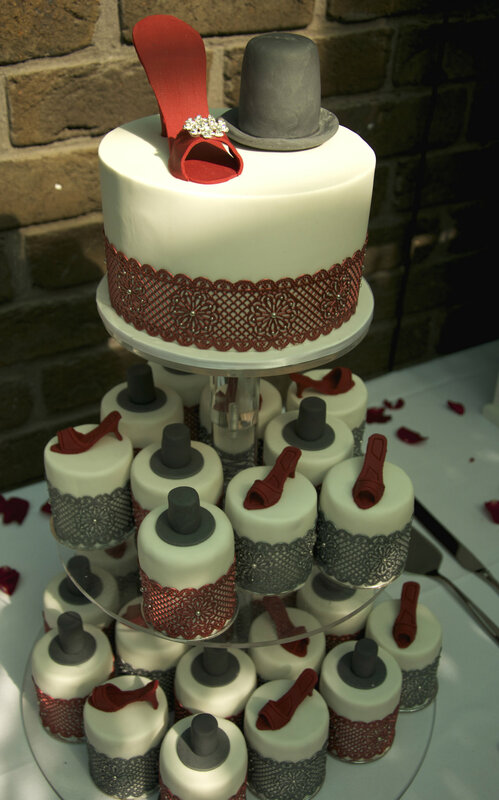 Served as a three tier cake with small round for the bride and groom to cut at the top, as well as smaller mini cakes adorning the bottom tiers, the cake toppers were a symbol of the bride and groom and a perfect addition to the overall theme and feel of the wedding- an adorable fondant top hat and red high heel shoe. The delicious red velvet and caramel cakes were situated next to a classic white wishing well and sprinkled around with red rose petals, adding to the overall effect and pulling the guests into every corner of the venue. Overall, the entire sophisticated and stylish atmosphere and feel of the event was reflected in every part of the decorations and simply sang of the bride and the groom. Smaller decorational elements were catered for, right down to the sleek black lighters used to light (and burn my thumb!) the love heart shaped sparklers upon the departure of the bride and groom, and guests had a fun time drinking in the love shared by everyone for the happy couple. 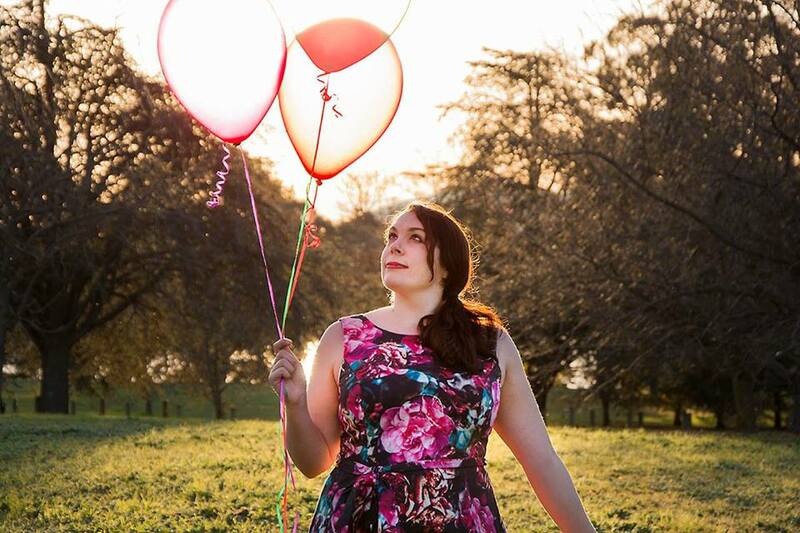 The children of the guests were also fabulously cared for, with brightly coloured balloons and play things to keep them occupied while the guests dined. Overall it was a wonderful event, and definitely full to the brim of great decoration ideas if you are looking to have your own burgundy, red and black soiree of a wedding. ← 5 Ways to Use Pineapples!